This summer, the Minnesota Wild have seen two goaltending prospects walk through the door, into the sunset like John Wayne in The Searchers. 2010 6th Round draft pick Johan Gustafsson has announced that he’ll be returning to the SHL in Sweden this coming season. While 2013 7th Round draft pick Alexandre Belanger will be leaving the organization’s system, with the Wild have deciding not to offer him a contract. Belanger will re-enter the NHL draft. Before coming to North America for the 2013-14 season, Gustafsson posted two incredible seasons in the SHL while playing for Luleå. 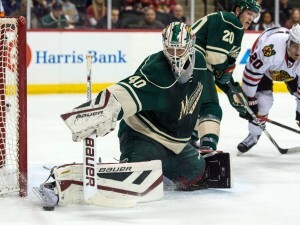 In the 2011-12 season he had a .932 save percentage with a 1.68 goals against average through 29 games. (Notably impressive, even though GAA tends to do a better job measuring team defense than goaltending prowess.) The next season he had those numbers tic up slightly, posting a .933 Sv% through 33 games. Then he made the move to North America, playing for an Iowa Wild team who wasn’t doing him any favors. In both of Gustafsson’s seasons in the AHL, the Wild finished dead last in the league. However, Gustafsson wasn’t able to reproduce the success he had in the SHL. In his first season he had a .903 Sv% through 40 games and then a very rough .893 through 35 games last season. With the goaltending carousel running at full throttle in Minnesota the last few years, including a stint where Josh Harding and Darcy Kuemper spent time in the AHL this past season, Gustafsson even got bumped down to the ECHL last season, posting a .899 Sv% through five games with the Alaska Aces. Gus’ return to the SHL is a big loss for the Wild. Not in terms of the player that left, but in terms of the player that they thought was coming over in 2013. At that time he was considered to be above Kuemper in the pecking order and that he might be the next goaltender the team could develop and run in the net for the long haul, the way they did with the undrafted Niklas Backstrom. Belanger is representative of the Wild’s drafting strategy — and many teams’ strategies — over the last decade plus. He was a seventh round draft pick the team took a chance on. The Wild rarely take a goaltender higher than the third round. In fact, in 15 drafts, the franchise has only ever taken a goaltender above the fifth round five times and only twice in the last nine years, one of which being Kaapo Kahkonen (4th Round) in the 2014 draft and the other being Matt Hackett (3rd Round), who the team moved to the Buffalo Sabres in the Jason Pominville trade. Belanger was drafted by the Wild after posting a .875 Sv% for the Rouyn-Noranda Huskies in the QMJHL in the 2012-13 season. That ranked 19th in the league that season. His .881 the following season ranked 18th and this season he posted a .881 split between Rouyn-Noranda and the Cape Breton Screaming Eagles, after being traded midseason. His lack of development may have turned the Wild off of signing Belanger when they’ve also got a number of goaltending prospects who have yet to turn pro (or turn pro in North America), including 18-year-old Kahkonen posting great numbers in Finland, Steve Michalek completing a very good junior year at Harvard, and recent college free agent signee Brody Hoffman hitting the AHL this season. The Wild are one of the few teams who haven’t been able to settle their goaltending question for years. The last time they had a starter posting consistently solid numbers for a season was Backstrom in 2011-12. He carried most of the load the following year, with less exciting results. Injuries hampered him after that, with his performance already declining as he hit the back side of his thirties. Harding briefly stole the job from him, but multiple sclerosis made it impossible for him to stay in the game. Since October 2013 the Wild have put 6 goalies in net, including Backstrom (40 regular season games), Harding (29), Kuemper (57), Devan Dubnyk (39), Ilya Bryzgalov (12), and John Curry (4). 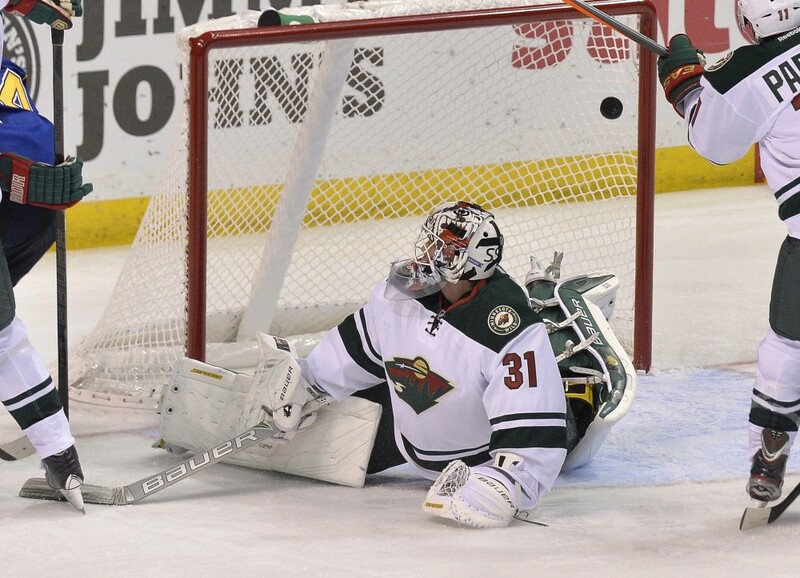 If the club can sign Dubnyk to a deal this summer, they hope that the insane carousel in St. Paul may come to an end and Kuemper may be the solution after that. Dubnyk had a great year, Kuemper was patchy, they’re still without a definitive long-term solution at the moment. However, one of the team’s top goaltending prospects not working out and a late-rounder falling off the radar may drive home the need to draft one of the top goaltending prospects in an upcoming year if they don’t want goaltending to be the perennial issue it has been. This season, 18 of 30 starting goaltenders in the NHL were drafted in the first three rounds of the draft. Since 2003, the Wild have taken two goaltenders in the third round, none in the second or first. One of those two was Hackett, who was traded away, and the other was Kristofer Westblom, who never made it to the AHL level, playing his most recent hockey in the CHL during the 2013-14 season. (He was to play for the Rapaces de Gap in France, signed, and then separated from the team before the start of the season).